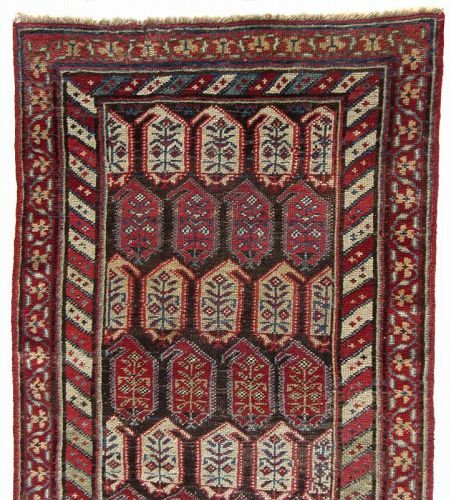 Antique Persian Baluch rug, 100% hand woven wool in rust brown, light red, and indigo hues, with repeating geometric motifs throughout. 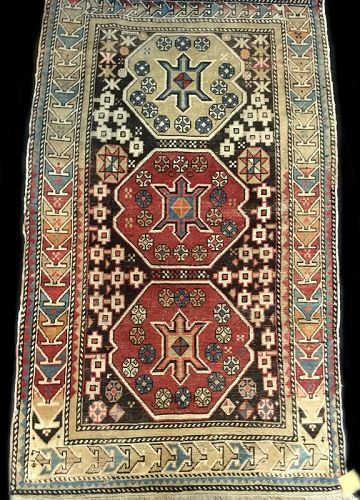 These rugs are hand-knotted by the nomads of Baluch. 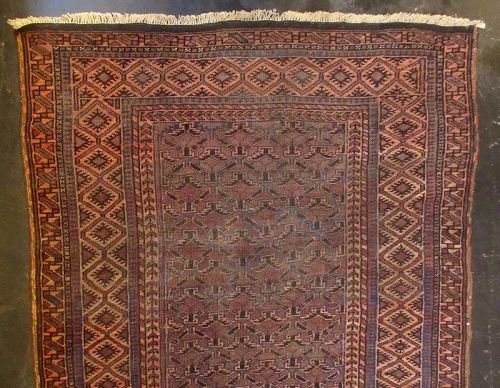 Baluch or Baluchistan is the area between the borders of Iran, Pakistan, and Afghanistan-- this is why Baluch rugs are said to be a mixture of three different regions. 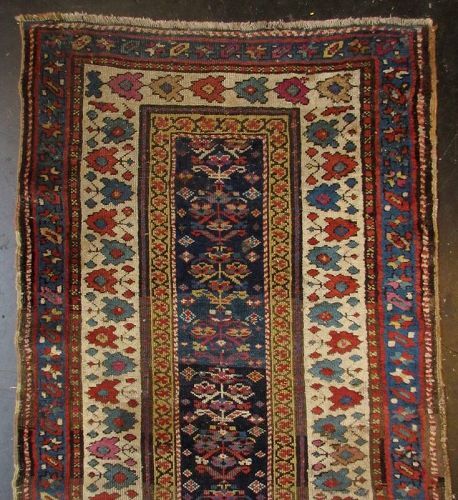 Dimensions: 3' 10" x 11' 8"
Antique Persian hand-woven 100% wool runner carpet, originating from the large village of Malayer with natural dyes of rust red, indigo, light blue, rust brown, and beige hues. With repeating boteh medallions, four borders with scrolls and floral motifs. Dimensions: 3' 4" x 12' 8"
Tibetan hand-woven seat cover, once would have used by a Buddhist priest. 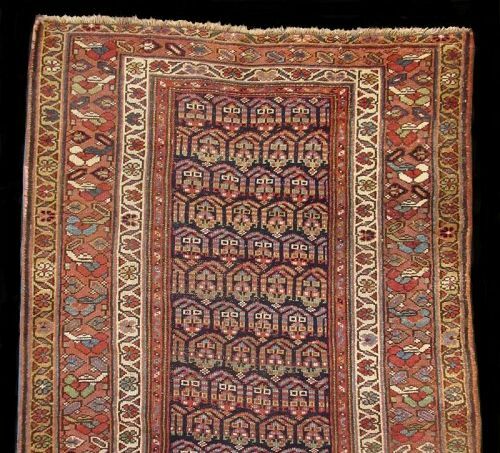 The region of Ningxia supplied the Buddhist monasteries of western China and Tibet with these rugs. 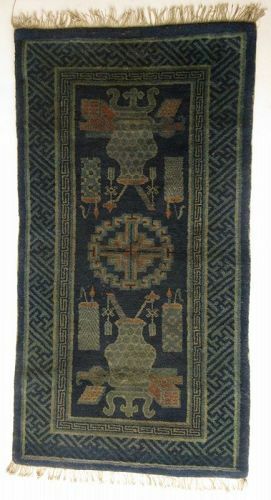 The textile with central four prong vajra, with vajra corner guards and a simple guard band border. Hand-woven wool with cotton. 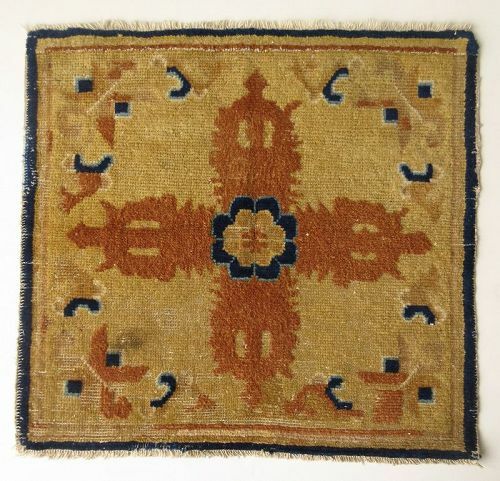 Chinese rug from the Baotou-Suiyuan area, hand-woven in shades of blue with beige accents. The central image of a geometric medallion surrounded by scholar's objects, with scrolling meander double border, with white fringe edges. 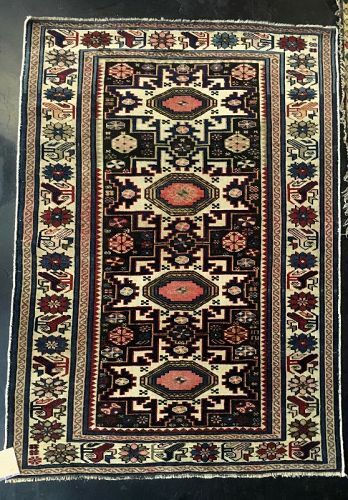 Antique Caucasian Azeri runner rug, hand-woven, all wool in repeating Shirvan motifs in navy blue and rust brown and cream colors. 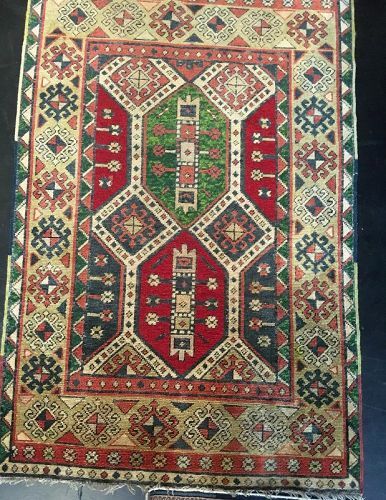 Antique Turkish rug, hand-woven, all wool in bright red, green, navy blue, and cream natural dye colors. In rural areas, often times goat hair is incorporated in the weave along with sheep's wool. Motifs of praying arches and medallion repeats with tribal influences. 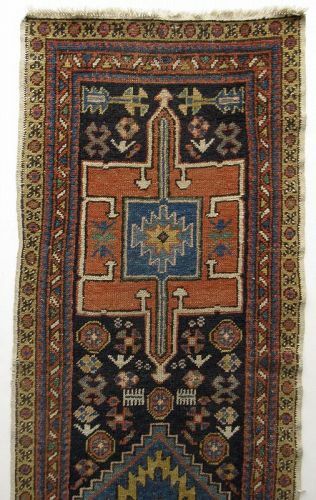 Antique Caucasian Azeri rug, hand-woven, all wool with Lesghi-styled pointed star medallions in navy blue and red tones against cream ground. Dimensions: 2' 10" x 3'11"